Five years ago I made a similar tart to this and I have been asked to repeat it. However, I am altering that slightly and, I think, making it even more special. The almond pastry is really delicious and the filling scrumptious. Do try this over the Christmas season, it’s particularly good served warm with cream but nice at anytime. You will need a 20cm/8in tart tin or flan dish. For the decoration (optional) a holly leaf cutter is required. Mix together the flour, ground almonds and salt. Rub in the fats. Stir in the sugar. Mix with just enough water to make a firm dough – approx 5 teasps. Rest it in the refrigerator while you prepare the filling. Peel, core and chop the apple into small pieces, halve the grapes and cherries. Cut the marzipan into small ½in/1cm cubes. Mix all these into the mincemeat with the almonds and brandy or sherry. Heat the oven to Gas 5/190C. Grease the tin or dish. Roll out the pastry to line it. Spread with the filling. Bake for approx. 25 minutes or until the pastry colours lightly. Remove from the oven to decorate. Decoration: colour most of the marzipan green, roll it out and cut out 5 holly leaves. Colour a small piece red to make berries. 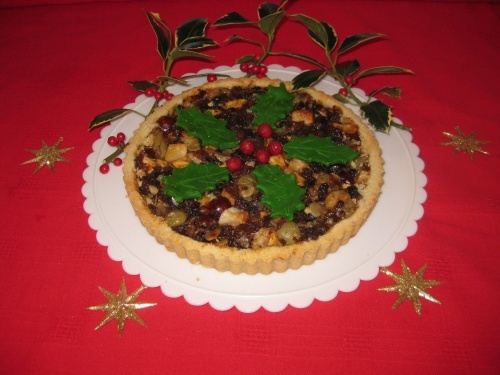 Arrange the leaves and berries on the tart.